Whether you are looking for a non-titling plastic or a tilting beach wood overbed table, our NHS overbed tables range has the perfect solution for you. The Renray range boasts incredible benefits including lightweight, durable and easy to clean designs, they are also available in a variety of colours. 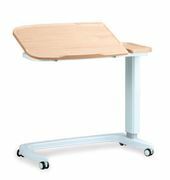 With a gas, spring assisted height adjustment the tables are suitable for being used both when the patient is in bed but also sat in a chair. Overbed tables are the perfect addition to any medical environment including care homes and hospitals, or even at home, for anyone who is recovering from surgery, bed bound, or disabled. Whether it’s eating, drinking, reading or even doing a crossword, with adjustable height and tilting top our overbed tables enable comfort at all times no matter the task. With over 50 years of experience, we have been able to perfect the design and build thus allowing us to provide our customers with only the highest quality products. For more information on our overbed table range, check out the individual products, download the brochure, call 01606 593 456 or even use the online enquiry form and we’ll be happy to help.